The US, Russia, Iran, Turkey and Israel are all on a collision course with each other in Syria as each maneuvers aggressively to get the most from the endgame of the brutal Syrian civil war, now approaching its seventh anniversary. The danger of a big-power conflict starting by accident rather than intention has not been so high in decades. All five regional and global powers, except the US, have had an aircraft shot down inside (or from inside) Syria in the space of about a week. During the same period, US jets bombed a Syrian government force — whose patrons are Russia and Iran — and growing tensions between the US and NATO ally Turkey reached the point of military threats. Analysts say that the Turkish intervention in northern Syria, which started just over three weeks ago, foreshadows a new and dangerous phase of the Syrian civil war. Once mainly a battle between the Syrian government of President Bashar al-Assad and anti-government rebels, the conflict has morphed into a multi-sided war involving Syria, the US, Russia, Iran, Turkey, Israel and various groups affiliated with al-Qaeda and ISIS. 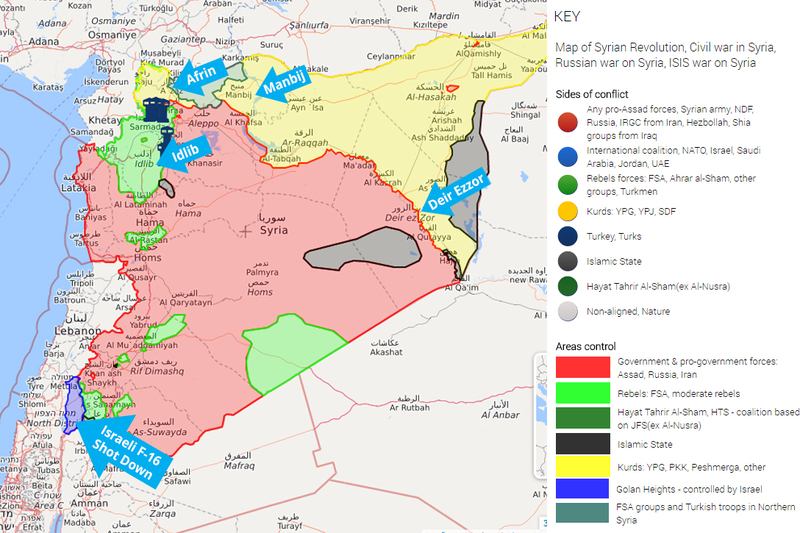 The (near complete) defeat of ISIS and a string of military victories of the Syrian regime against the rebels have cemented Assad’s rule over much of the country and carved out a Kurdish autonomous zone, aided by the US, in the north. These developments have pushed countries such as Turkey, a traditional enemy of the Kurds and an ally of the rebels against Assad, to act as spoilers. We have written about this extensively in the past. According to reports in the Israeli press, the F-16 downed inside Israel by Syrian anti-aircraft missiles, just after it had bombed the control vehicle of an advanced Iranian stealth drone that had crossed into Israel’s airspace earlier, is the first Israeli warplane to be shot down since 1982. In response, Israel claimed to have seriously damaged Syria’s air defenses while striking several Iranian targets. What is particularly interesting is that many in Israel appear to see Russia, rather than the US, as having the power and responsibility to prevent a larger war. Will Turkey risk attacking Manbij while US forces are engaged there? That question may be decided by domestic Turkish politics, according to Ege Seckin, a Turkey expert at the London-based analysis firm IHS. 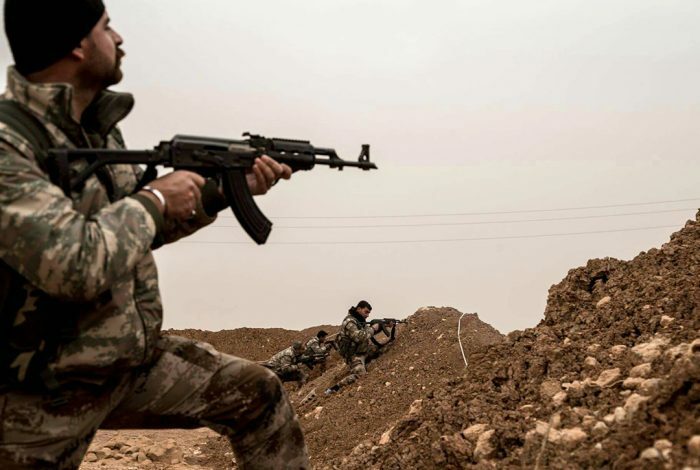 After the Syrian government attempted to attack Kurdish forces allied with the US in southeastern Syria, the US launched airstrikes on Syrian government forces that reportedly killed over 100 Syrian soldiers. Persistent but as yet unverified reports claim that Russian military contractors were among the casualties (a recent Bloomberg report somewhat implausibly claimed that up to 200 Russian contractors may have been killed). Experts say it was a message to the Syrian government, Russia and Turkey that the US will stick with its allies. The Kurds and the Syrian government have kept up an uneasy truce for years while fighting their common enemies — ISIS and other Sunni jihadists, including groups backed by Turkey. The recent attack, nevertheless, took place near lucrative resources: some of Syria’s largest (if still fairly small by international standards) oil fields, held by US allies. It may well have been an opportunistic attempt by the government forces, especially since the Kurdish-led forces had just reportedly withdrawn some of their fighters from the area in order to counter the Turkish invasion of Afrin in the opposite northwestern corner of the Syrian map, some 400 kilometers away by road. “It wouldn’t surprise me if Syria wanted to probe and see what happens,” said Landis. Syrian rebels shot down a low-flying Russian military plane over the northern province of Idlib on February 3 and killed the pilot in ensuing clashes. Russia responded by launching airstrikes at rebel-held territory and closing Syria’s airspace for Turkish aircraft for a few days, hampering the Turkish operation in neighboring Afrin. On Thursday night, nevertheless, Turkish airstrikes on the Kurdish positions resumed, in what some speculated was a Russian response to the US strike in the southeast. The plane was shot down just as Turkey was seeking to set up a military observation post in Idlib, and reportedly to block Syrian army advances against the rebels nearby. A Turkish soldier at the observation post died on February 6 in an artillery attack believed to have been carried out by pro-government forces. It was the second time in two weeks that the Turkish army came under attack while trying to set up positions in the area. February 10 was the deadliest day so far for the Turkish army in its Afrin operation, dubiously named “Olive Branch.” At least one Turkish military helicopter was shot down by the Kurds (separate unconfirmed reports say two were downed) and no fewer than 11 Turkish troops were killed in clashes. The fog of war is thick over Afrin and the accounts coming from the different sides differ spectacularly. Looking at the map, it seems fair to estimate that in about three weeks of fighting Turkey and its allies have captured about 10 percent of tiny Afrin. The Kurds are responding with guerrilla tactics: mountainous and rural areas change hands frequently and the invading force is suffering significant casualties. Once the mountains are conquered the pace of territorial conquests should speed up, Seckin said; but, the real trouble for Turkey would come once its forces reach densely-populated urban areas such as Afrin city. “If they try to take those urban areas, I think we’d be looking at a completely different ball game,” he added. Many analysts (including Seckin) expect a siege of Afrin to be more difficult than the Turkish-led storming of the nearby ISIS-held city of al-Bab a little more than a year ago. That operation took over three months. Internationally, moreover, Ankara already appears to be losing the war of perception. Reports about Turkey recruiting former ISIS foot soldiers and other jihadists to fight against the Kurds, who played a key role in the defeat of ISIS in Syria and Iraq, are just the latest fiasco for Ankara. Turkish bombardment has killed over 100 civilians, according to local reports. In videos circulated on social media, Turkish-backed forces have been shown torturing civilians, looting and mutilating the bodies of fallen Kurdish fighters. The Turkish armed forces have devastated world-heritage sites, schools and water facilities alike. Domestically, while the war has rallied unprecedented support for Erdogan, it has also further damaged what’s left of Turkey’s democracy. In three weeks, the government has detained hundreds of its citizens, including 11 members of the Turkish Medical Association, for criticizing the military operation. Different reports, including one in the British newspaper The Independent, say that ISIS, after crushing defeats in Iraq and Syria, is trying to resurrect itself — with, at least indirect, Turkish help. On February 13, US Secretary of State Rex Tillerson also reportedly claimed that Turkey’s operation in Afrin is harming the fight against ISIS. Stay tuned as we bring you further developments. Related front page panorama photo credit: Adapted by WhoWhatWhy from Recep Tayyip Erdogan (President of the Russia / Wikimedia – CC BY 4.0), Bashar al-Assad (Fabio Rodrigues Pozzebom / ABr / Wikimedia), Donald Trump (DoD / Wikimedia), Benjamin Netanyahu (TheCuriousGnome / Wikimedia), and Vladimir Putin (President of the Russia / Wikimedia – CC BY 4.0).